Ross had ideas for a trip to the Needles. 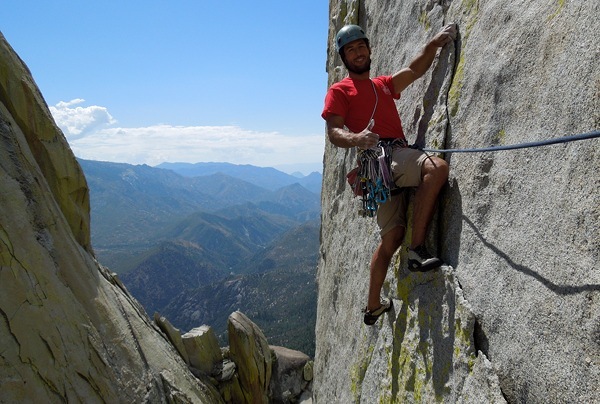 I was originally planning to go three weeks without working more than a few days so I could climb at Long's Peak, Squamish, the South Platte, then finally Cali with Ross. It seemed like there was too much to do so I canceled everything but Cali. There was still too much to do before the trip, but so be it. Friday afternoon might have been the only time in my life I've been an hour early for a flight after checking my duffel bag and passing through security. So it figures that the flight was delayed by an hour. Ross, Trisha and I had grubs and suds at a reggae shack on OB (Ocean Beach, how original). 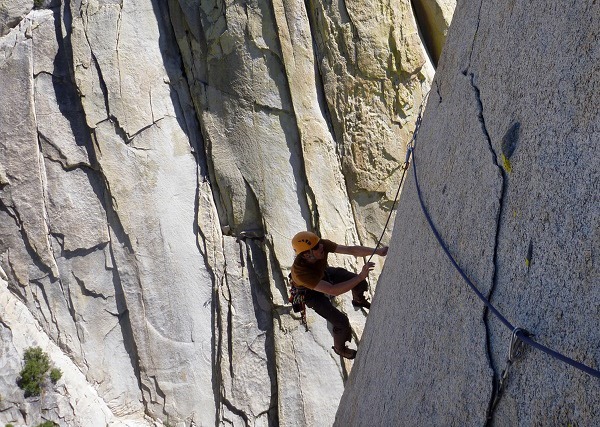 Ross asked me if I wanted to climb a few Needles warmup routes or just jump on Atlantis. Why scare myself on thin, runout 5.9 and 5.10 when we can just go full tilt right out the gate? Lots of driving, a relaxing campfire and a three-mile hike put us in the midst of the Witch, the Sorcerer and the Charlatan. 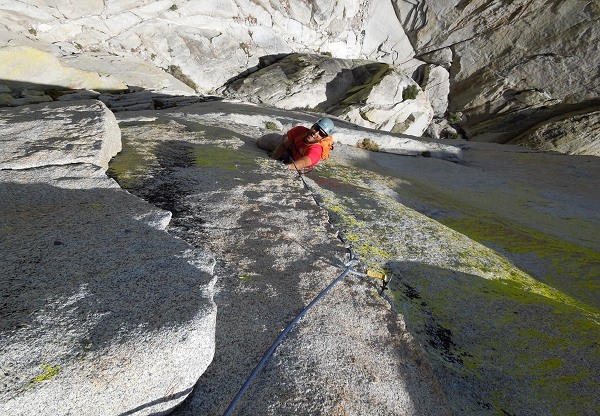 First pitch of Atlantis: glad my first real pitch of Cali rock didn't feel too sandbagged. Ross on a lieback through lovely lichen. Ross likes it on lead. 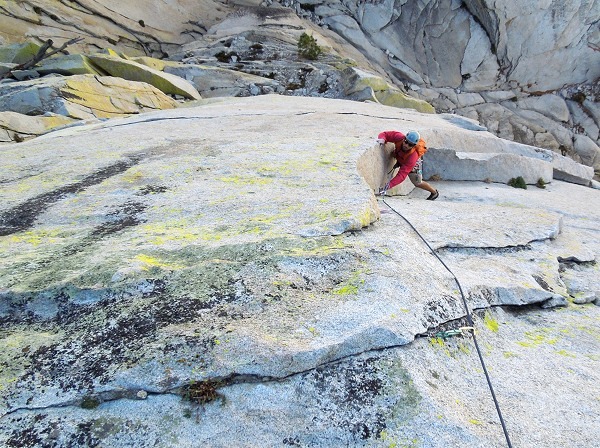 The money move on the second pitch involves smearing feet while pulling on a flexing flake. 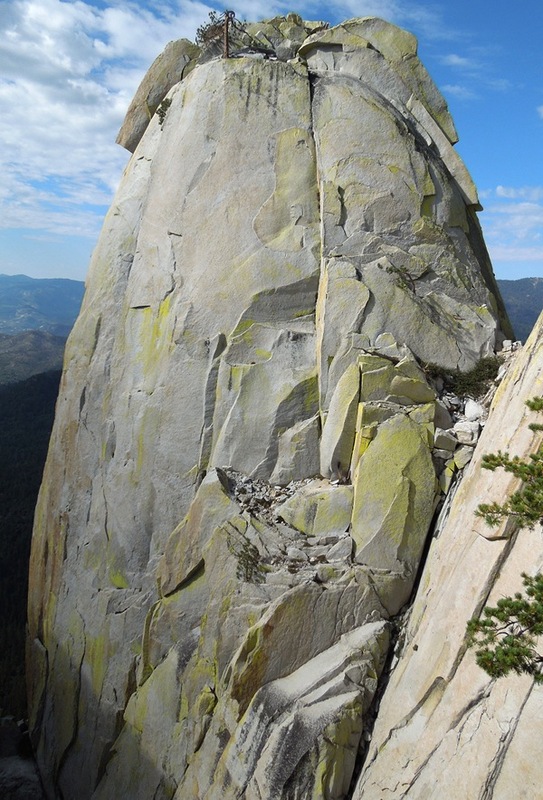 The third pitch is the crux. I was contemplating thin, strenuous moves above a small alien and a #1 BD TCU from the ledge when a thunderstorm hit. We waited a little longer than any of the other parties to bail, but it's a good thing we did. The 70 m rope came in handy as we fixed it in retreat. Several of us were huddled in the gully during a deluge, unwilling to risk the ridge in frightening lightning, then came the hail, then the wind and more rain. Beers, pastis and a campfire consoled us and the next morning we returned with a leisurely start to send. 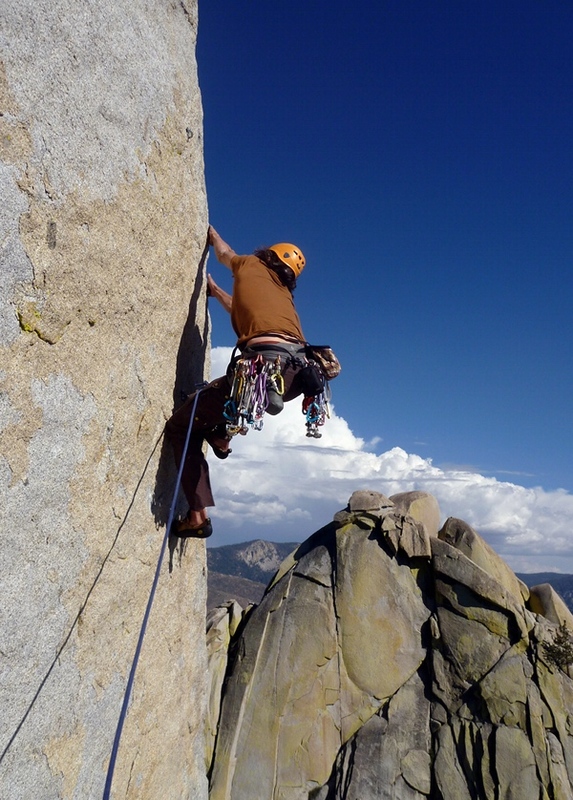 Leading the crux pitch of Atlantis. I was very happy with that brassy at the bottom of the picture. 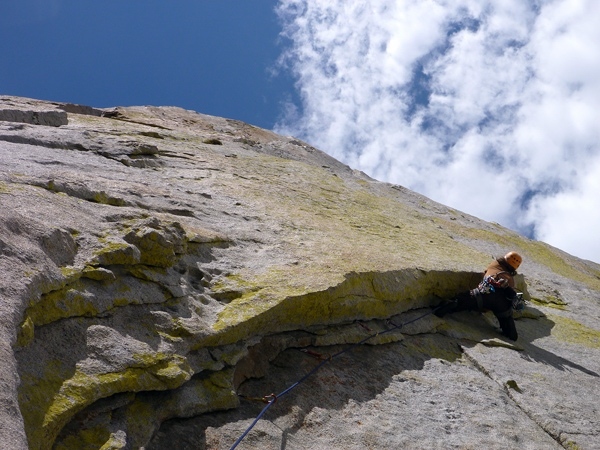 The gear stays thin throughout the pitch but in retrospect this pitch seems fat compared to several places on Romantic Warrior. Speaking of thin, the "handcrack" that ends the pitch is pretty much a 0.75" splitter. But it is stellar. Just ask Ross. True to form, Ross wanted to lead the extracurricular, thin Lost at Sea pitch so I could lead the 3.5" weirdness on the final pitch of Atlantis. Here he's heading toward the spicy mantle at the end. 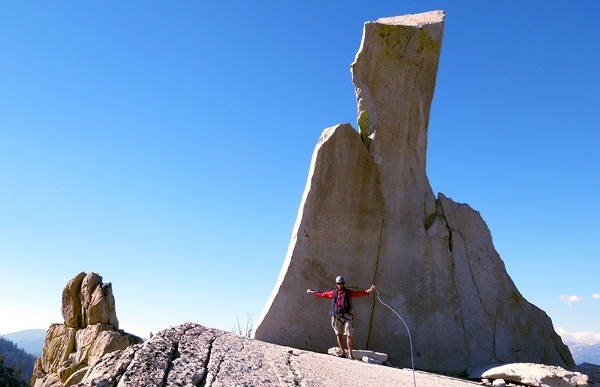 The whole flake is thin and hollow; the leader and belayer can communicate via morse code by knocking on it. 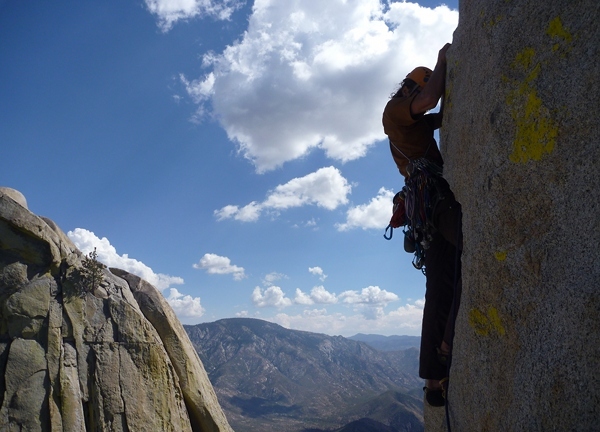 Ross thought about the finish moves after the long traverse to the thin mantle move at the end. With nothing but a 000 TCU behind the flake below the chains, the real question is how many other thin pieces would pop from the flake as it flexes after a fall? Ross pulled the moves so it's an open question. 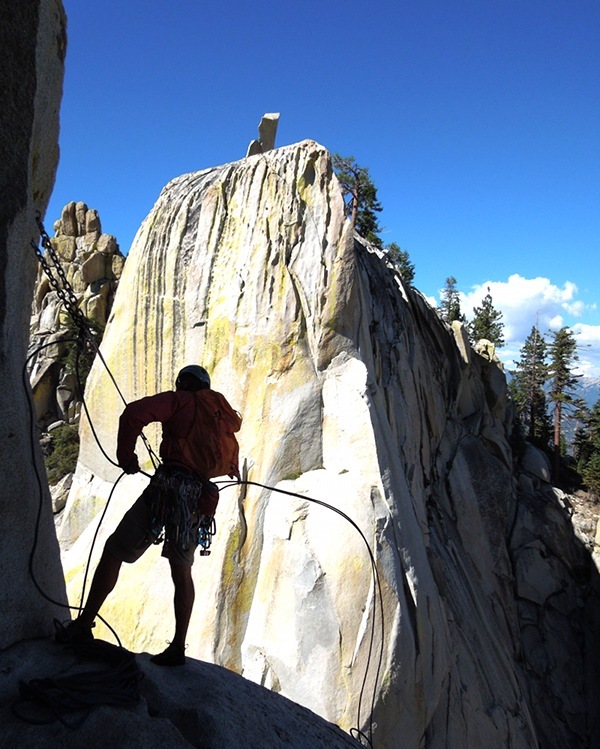 The last pitch of Atlantis starts with several kinds of weirdness off the belay. Slopers and smears lead to a flaring lieback with a cruxy transition to an undercling. Atlantis finishes with a striking steep corner. I placed several shrinking TCUs, then an RP, then I looked to my left and felt great relief to grab a positive ledge and sidestep to freedom. Ross as it gets thin. 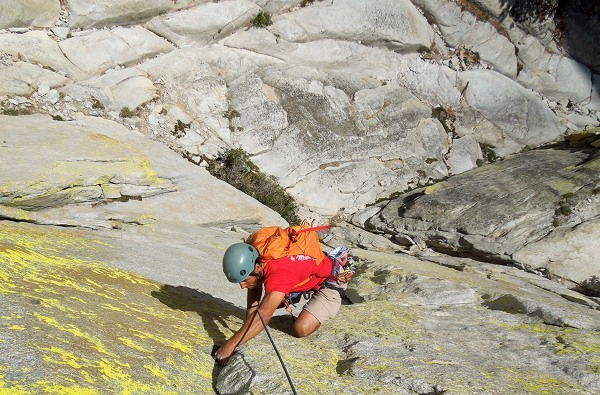 Ross sets the rappel to the notch. 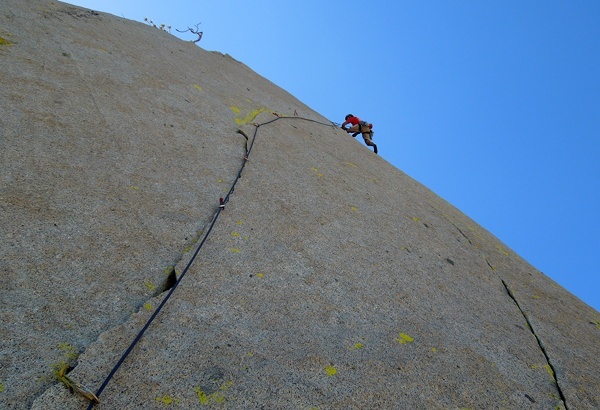 There is a fun bolted arete available. 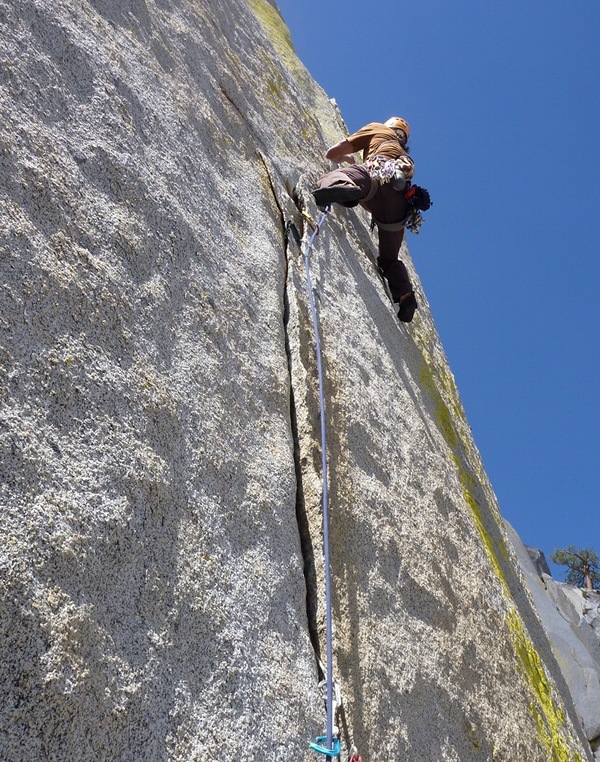 Ross coils the rope atop the Charlatan. That wasn't half bad! Now how about Romantic Warrior?